If you’re passionate to draw and doodle then you’re one of the natural candidates for the work of cartoon animation. As they create scripts and pictures which work together to tell a particular story, an animation cartoonist is someone who is talented in the areas of art and writing. When you’re a cartoon animator you often obtain work from the magazine and/or newspaper publishers and may create images for greeting cards, video games etc or other forms of digital media. Along with featured in video games, movies, and TV shows, as well as on websites, an animation cartoonist also referred to as animators, create visual effects. Besides, the 2-D or 3-D animations are used to replicate the features while creating from computer software programs. Like much of the entertainment business, the animation industry is hard to break into. Although the majority of animators work either in the motion picture or video industries, the employment also is available in advertising, computer systems design and Web design. Engineering, scientific research, and medical research have a great demand for drawing. Career opportunities for multimedia artists and animators are expected to increase 6% from 2014-2024 according to the reports. Despite this growth is fueled by the public’s demand for more and better realistic video games, 3D animated movies, and television special effects, fewer employment opportunities will be available in Bangladesh as there are huge competitions in this industry. Although the median annual salary of animators in 2015 was $63,970, the highest 10% of animators earned more than $113,600 that year. In the context of Bangladesh, most of the animation cartoonists are working either freelancing basis or gone foreign permanently. 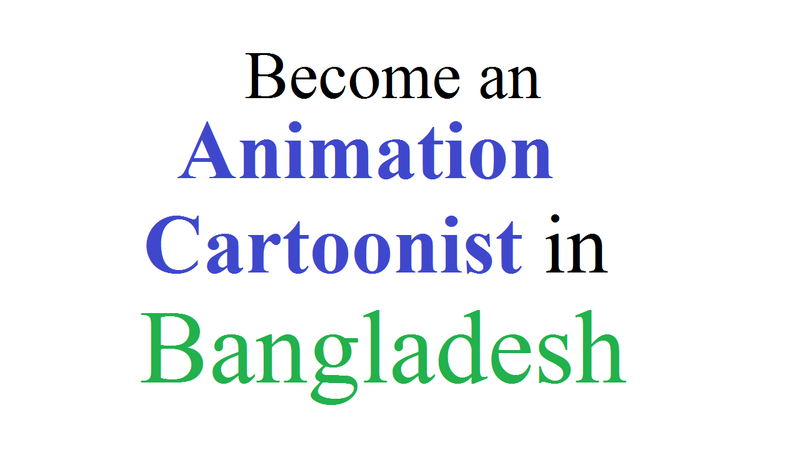 This is because Bangladesh has the lowest demand and salary for the animation cartoonist. Although a bachelor’s degree in art, multimedia or animation is highly sought after by employers, post-secondary coursework in a related field can be acceptable to some employers. There are few written qualifications that can easily land one a job in the animation industry, especially in production despite the various credentials one might have tagged across a résumé. But, those who don’t have experience in the field, the situation are even bleaker for them. Even there are no academic programs in the country that provide an education for would-be producers of animation an undergraduate degree, MBA or Animation MFA. Despite those are tailored mostly for artists, the closest academic options are undergraduate and graduate programs in animation; however. But, don’t worry because we’re here with you to assist you to be an animation cartoonist in Bangladesh. Well, let’s know a few steps that will be helpful to you to being a cartoon animator. In order to master the drawing skills and storytelling techniques needed for a career in cartooning, professional cartoon artists typically complete a 4-year degree. You may take a number of courses that help you expand on various comics’ practices and styles during the course of the 4-year bachelor’s degree. History of cartoons, experimental and narrative storytelling, inking and illustration are the typical courses. You may get a head start on your career by gaining professional experience in an internship with a professional cartoon artist during the course of your degree. Also, you work on compiling a portfolio of work that best showcases your drawing abilities and cartooning style by your senior year. While many different genres are available in cartooning, some are single-panel cartoons that include a short caption and range in content from politics to zany humor. As other cartoonists work with a comic strip format, they create a short panel of images that illustrates humorous scenarios or adventure stories. Apart from these, each animation cartoonist adopts a distinctive style, format, and voice that influences her or his success and helps market the work. You and your fellow cartoonists might use a variety of different media to create a cartoon. Although in the past, cartoonists would draw in pencil, charcoal or pen and ink, scan the images and send the drawing to an editor to publish, recent advances in technology allow you to create work digitally by working in design and illustration software. That’s why now you can send the images online or as a file attachment while having a varied portfolio can help you market your skills. This is not only as an accomplished cartoonist but as an illustrator and artist also. It means you are contracted to work on a specific project for a set amount of time when a professional cartoon artists work freelance. As newspapers and magazines work with a number of different cartoonists at the same time, they commission a set amount of strips, and if your cartoons are popular, you may have your own weekly or monthly comic strip. You may work additional jobs in a different career because other cartoon artists work less frequently. You may manage your own website to publicize and feature your work when you’re a cartoonist. Where you reach out to other cartoonists and contribute to anthologies and magazines is another option is attending comic book conventions. Apart from these, you’ll also need to make connections with editors and publishers when possible. There is more professional animation cartoonist than available position and that’s the great issue and challenge in this career. You might want to build a reputation and get your work out as soon as possible to give yourself an advantage. In order to publish your work, you might approach school paper editors and newsletter writers, as well as school or community newspapers. Also, you get help from the early feedback and experience. Since these steps also help you get noticed as a serious cartoonist, they may increase your chances of getting published in larger publications. Some choose to study at cartooning colleges while other freelance cartoon animators never attend a formal program of higher education. While internships and/or apprenticeships with the company, art competitions those hosted by the National Endowment for the Arts can be helpful in gaining skills. This way you should keep developing your skill and experience so that you can get more jobs in this industry as an animation cartoonist. And we’re sure if you follow the above-said steps then you should be successful in the job of cartoon animator. Good Luck!